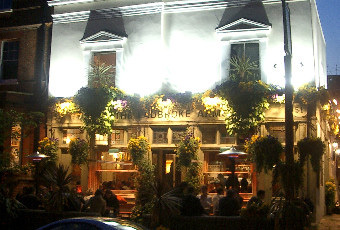 Definitely in the top ten pubs in London - it is still a pub - despite a fab restaurant - and have for many years popped into this as my local, for a pint and some peace and have always been made welcome. And so has my dog. We popped in here for a drink earlier and couldn't have been made to feel less welcome. We sat in the 'bar', but because we didn't want to eat were made to feel like we really shouldn't be there. Sorry, but it looked like a pub from the outside! I agree that the atmosphere of the pub is quite nice. Went there for the first time yesterday. Unfortunately the nice atmosphere was ruined by the rude and terrible service. Maybe they should take a hint and read some reviews which say similiar things! We were approached by an extremely rude waiter who got annoyed and impatient jsut because we had told him that some people from our group had gone to order food from the bar with their drinks. He just stormed off after saying 'Well, they can't!' Only to return a couple of minutes later to say 'Well....where are they?' when he discovered that the rest of the group had not yet returned to the table. Definately not going back there again, and people who are not interested in the service industry should just consider a career change. Never been less welcome in a pub in my life! Bar staff have obviously worked on being unfriendly as a team, so you'll be lucky to get a smile from them, never mind anything other than a skulk. Its otherwise quite a nice cosy pub, but its a shame that the staff can't make the effort. Was there last night with friends and it seemed like they couldn't wait to kick us out. Have to say the point of discussion with other customers was how rude the staff were, and many people left that place irritated by the service. Will try not to come again, unless the staff changes or if its a nice sunny day to sit out at the front. One other thing to add is that the lager is terrible - flat and warm. The reaction to my bringing this to their attention was for the whole team to gather round, tutt and scowl, then audibly grumble 'fussy git'. After 5 minutes inspection of the festering liquid they begrudgingly poured another sloppy pint that was just as bad - but it wasn't worth the hassle facing the staff to ask for another one.